Thanks for stopping by. Are you new to Black and Bookish? Please take a look around. These are the Books I've reviewed or you can Start Here to get an overview of who I am and what I do. Don't forget to subscribe to get news and posts sent straight to your inbox. The weather is finally cooling down in Los Angeles and now that Halloween is over, it won't be long before we all start hearing Christmas Chorals. Everything moves so fast here in LA LA land. This week I thought it would be fun to give you some dirt on me a chance to get to know me a little better. Each interesting article I encountered this week found a way to link itself back to me in a more personal way. 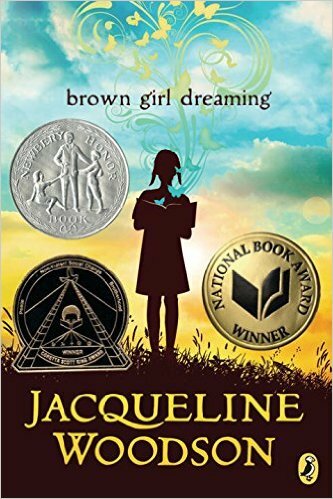 I've slowly started to read Brown Girl Dreaming by Jacqueline Woodson as a read-a-loud to my girls. They are still pretty young to be completely engaged; however, the language is mesmerizing and the use of poetry helps to make the content relevant. Her imagery reminds me of growing up in a southern family and really missing my hometown. Sharing this memoir with my girls is a way to show them some of my own histories in a context they already enjoy. I haven't gotten very far, but from what I have read, and what other have said about her writing, I would recommend it. Have you read it? What did you think? I'm also in the first few pages of another poetry memoir of an indie author by the name of Kevin Anglade. Titled Life Comes from Concrete, he is the founder and president of Flowerd Concrete, an independent publisher based in NYC that focuses on black authors. This is work I would like to be doing in the near future so partnering to bring his work and the books of others is a very big part of Black and Bookish. I hope by showcasing their work I can help supporting their craft. Visit kevinanglade.com for information and to purchase his book. I'm still entangled in Americanah and I think that's because the point of view switch and I lost some interest. Not to say the book isn't a masterpiece but the pages are starting to add up in this love story. I'm almost 400 pages in, more than halfway through, and I'm ready for the climax to hit so I can wrap this up. I've probably talked about this before but I have a multicultural family. My husband is white (of unknown origins), making my daughters mixed/biracial. My husband and I very clearly emphasize to my oldest her cultural heritage because we have very little information about our ancestries. We do this because there can be some ambiguity that follows mixed race children or multicultural families into adulthood and I want my girls to have the full confidence they deserve regardless of their heritage. Here are some articles I came across this week that speak to the disconnect between race, the ability to connect to larger causes, and worldly expectations of multicultural families. Not Having A Black Boyfriend Doesn’t Make Me Less Black really hit home because- news flash, I'm still black. I'm very pro-black. A black activist in fact. A black, female, womanist activist who is very much for black liberation from institutional racism and discrimination. People tend to think very singularly when it comes to activism and positions on race, and may even forget that non-people of color can also be pro-black. My husband feels connected to my family and would very much like to end the racial discrimination my brothers face that he (my spouse) has only heard of. When we look at life in these shallow dimensions, we forget that individuals are complex. I’m Not the Nanny: Multiracial Families and Colorism, is a review of Lori L. Tharps’s (co-author of Hair Story) new book, Same Family, Different Colors: Confronting Colorism in America’s Diverse Families. Her research has led her to discover what parents do to compensate the color discrimination between light and darker individuals (a discrimination Alice Walker coined as Colorism), how these families are seen to outsiders, and what the next steps for many of us can be to ease the pain of racial discrimination all around. After reading her work in Hair Story and personally experiencing the ways in which colorism affects my life, I am very excited to pick up her book. And in select theaters, you can see the new movie Loving, starring Ruth Negga and Joel Edgerton, about the landmark case "Loving vs.Virginia". This case made it legal in all states to marry someone of a different race, something that could have you fined and jailed up until 1967. If you find that this movie is not playing near you, The Loving Story, a documentary about the same couple and court case, is streaming on HBO. June 12th is the anniversary of this court case and many around the country pause to reflect and remember the Lovings and their strength. Did you see or hear that Beyonce performed at the Country Music Awards on Wednesday night with the Dixie Chicks? And how can this be of any relevance to me??? Well, besides the fact that I grew up listening to country music, in addition to lots of other genres, watching the Dixie Chicks perform brought be back to high school. I've played classical violin since I was in grade school and learning Dixie Chicks songs and riffs happen to be something my friends and I would do. Not just the Dixie Chicks: I learned a mix of pop, country, classical, jazz, and hip-hop themes through my formidable years of playing. And finally, this coming Tuesday will be my third time participating in the general election. If you also feel it imperative to vote, but you don't want to "throw your vote away", some apps or sites allow for vote trading. As talked about in Third-party voters are “trading votes” with Clinton voters to defeat Trump, people in key swing states that want to vote for third party candidates are willing to vote for Clinton in exchange for someone voting third party in states that are already considered blue. This isn't the first year people have done this, and as of 2007 it is very much legal. Would you trade your vote? People have been posting their early voting pictures and although I have never voted early, I might before the week is out. Did you? For me its more than just a right. I like to remember those who came before me and who risked their lives to do so. Some of them, many of them, killed for this right. So I vote in every election, and I do so after researching the candidates and propositions. By this time next week, we'll have a new president elect. See you on the other side.